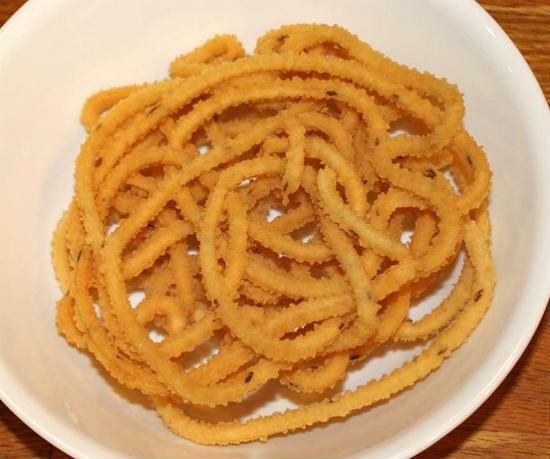 Mullu Murukku (or also known as Muthusaram in brahmin households across Tamil Nadu) is a very popular South Indian savoury snack made during Diwali or Krishna Jayanthi. A very easy to make homemade murukku, this is often served as an evening coffee / tea time snack. 1. Dry roast the dal and grind together to a fine powder. 2. Mix 1 cup of the dal powder with the rice flour. 3. Add butter, sesame seeds, red chilli powder and asafoetida powder. 4. Add enough water and knead well to a smooth dough. 5. 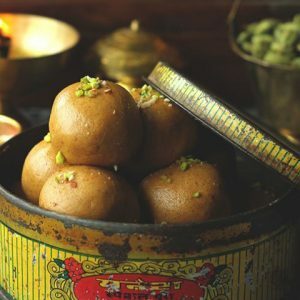 Make balls of this dough and add them to a murukku maker with spiky (mullu) plate. 7. Carefully press the murukku maker over the hot oil, one or two at a time. 8. Fry the prepared murukkus till light golden brown. Feel free to comment or share your thoughts on this Mullu Murukku (Muthusaram) Recipe from Awesome Cuisine.